Congrats on the success! Now I just need an avatar! Just joined! Will there be a Christmas giveaway too? Maybe I’ll be TL3 by then! I’m also hoping for a Christmas giveaway. Haha. More chances of winning! Haha. Also, just a heads up to those who joined but still haven’t changed their avatars! You guys have one more day to do so! And don’t forget to hit 3 posts also. Please don’t forget to change your avatars! Last day here! You gotta vote and if you want to join for lucky winner, you gotta post something (RELEVANT) in three (DIFFERENT) threads. Hi! 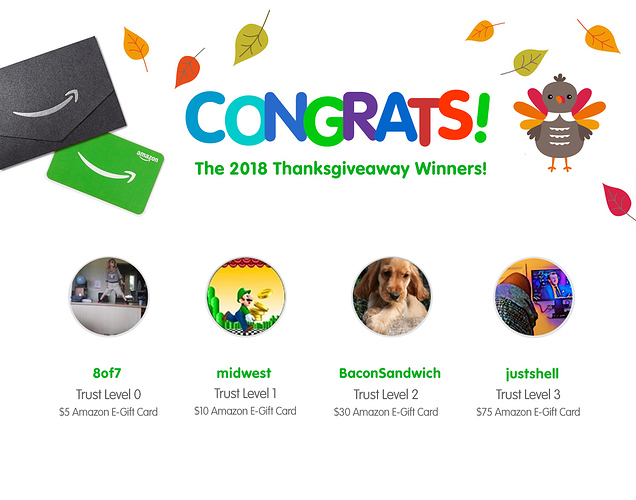 Just joined the Thanksgiving giveaway - hope I’m not too late. Looking forward to that Christmas giveaway too! Thanks, BabyPips team, for all that you folks do. OMG. You need to have an avatar to qualify. Huhu. I hope you’re online right now so you could change your profile picture. The greed is strong but I will resist the temptation to join. I hope. It’s time to announce the Thanksgiveaway winners! We now have our four lucky winners! For those new to this, our Thanksgiveaway was well, a giveaway. This means the winners were picked randomly. We had four separate data entries from each of the user trust levels (each post during the giveaway period was a single entry) and then we used a randomizer to select the winners. A “Yes” to our poll! Okay, enough of all the boring stuff. Time to show you this giveaway’s lucky bunch! Here’s the text version of that so we can tag ‘em! I’ll be in touch with the winners shortly to ask for email addresses! We will give all the winners 14 days to claim their prizes. If they don’t claim them within the next 14 days, we shall pick a new winner! And to all those who joined but didn’t win… we got another one coming up! It’ll be a little different this time. Because… this giveaway was way too easy, right??? Congratulations lucky winners, from ex-winner. OMG! Congrats to all the winners! Super happy for yoy all! I guess I’m just gonna have to try my luck another time. Haha. I’ll stay tuned for that BP team. Congratulations to all the winners! We have a lot more in store for the community, so please watch out for those! WoW! and Thanks, so what do I need to do next? Yaaaayyyyyy, thanksss sooo much,this just made my morning! Wow really, I won something…that’s so hard to believe!!! & so cool too!!! Thanks BPips and @Ananais ,haha😅 it feels like scales have fallen from my eyes! chai that’s really great enjoy yourselves guys.